L: 117" x W: 104" x H: 38"
Brinton 2-pc. Sectional Sofa With the perfect fusion of style and comfort, the rich contemporary design of this Brinton 2-piece sectional sofa features the comfort of thick padded arms and plush divided back cushioning. The refreshing modern design adds an exciting flair to the decor of your living space. With the perfect fusion of style and comfort, the rich contemporary design of this Brinton 2-piece sectional sofa features the comfort of thick padded arms and plush divided back cushioning. The refreshing modern design adds an exciting flair to the decor of your living space. L: 87" x W: 44" x W: 38"
L: 100" x W: 44" x H: 38"
Our salesperson was very nice and better that any of the others from competitors. He helped us without just trying to make a sale. The delivery and 5 year warranty was easy and affordable. The couch is modern, and comfortable. I could not be happier. Price was right, chairs are good size I didn't feel like my knees were in my chest sitting on it. Completely satisfied. Dean, we're very sorry to hear about this experience and would like to look into this for you. Could you e-mail your order details, contact information and a copy of your concerns to rfcare@raymourflanigan.com so we can better assist? Thank you! My husband surprised me with a new couch, but I was concerned that it was purchased without sitting on it, he got extremely lucky this is very comfortable and looks beautiful in our living. 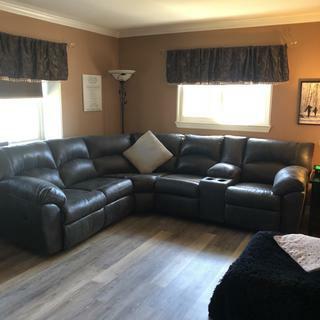 This sectional seems to be well made it's extremely comfortable and looks and feels amazing. We’ve had the sectional for two weeks now and so far we love it! Very comfortable and fits my whole family! good quality, contemporary look. and awesome customer service. The sectional is beautiful and super comfortable. Very roomy and spacious where my whole family can relax comfortably together. I am very pleased with my Raymour and Flanigan purchase sales guy and delivery. Personally, I love my furniture and it's beautiful in my home thank you so much for giving me the opportunity to do the 90 days same as cash program. Happy New Year! Love my new furniture! The guys that delivered it were very nice and professional. Love both pieces, especially my rocker recliner! Very comfy and recliners go back really far! But finish is shinier than what I had hoped.. and it’s rounder in the middle section than appears in the picture. I absolutely love the couch, it’s comfortable! The color is great and the material is soft! I was however very disappointed with the DAMAGE done to my walls from the movers. I only got the shipping figuring it was going to be done correctly and WITHOUT DAMAGE. I’m going to have to get this paint and plaster fixed now. I’m not happy with the damage at all! We would definitely recommend this couch. It very comfortable and fits our smaller space well. We love this couch already! Super comfortable and now we just need to see how it holds up to the stress of 3 kids and a dog! I'm so in love with my new sectional. It's very comfy couch I wouldn't change my couches .The delivery guys were fast at the set up Thank you Raymour and Flanigan from your loyal and satisfy customers. Only issue I’m having is the sectional seems to have a gap. I called and they’ll be reviewing the issue. Great, customer service! The head rest is not long enough, so when I recline my head goes back too far. For the price, it's decent. How many reclining pieces are included in this sectional? BEST ANSWER: The Brinton 2-pc. Sectional Sofa includes two reclining seats. Do you get everything you see in the photo above ? Dose it come built ? BEST ANSWER: The Brinton 2-pc Sectional Sofa includes the Left-Arm Facing Loveseat and the Right-Arm Facing Loveseat as displayed in the images. Raymour & Flanigan provides a White Glove Delivery service for the Brinton, which includes all necessary assembly and a comprehensive quality inspection of your furniture prior to it being delivered to your home. Some pieces may require final assembly in your home due to their size or configuration. can you put the console with the cup holders on the other side? BEST ANSWER: The console cannot be assembled on the opposite side. The Brinton Sectional Sofa is available in the configuration shown only. BEST ANSWER: The upholstery is a polyester, leather-look blend. BEST ANSWER: Hello Jaime! The Brinton collection is upholstered with a polyester and polyurethane blend fabric so has the leather-look but is similar to a suede material. It is easy to to clean and durable. These pieces have a manual recline. This isn't power reclining, it's manual reclining. It's not leather, but has a sheen to the fabric which makes it look sort or like leather. I wouldn't call it suede, but it's a very soft, brushed fabric. No It's not a power recliner.... It's Micro-Fiber ..... 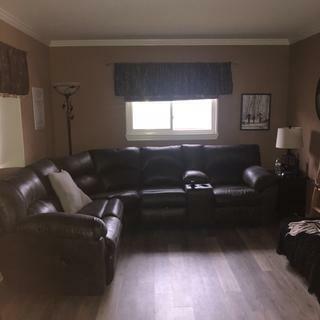 Very confortable .... We love it.. Nice and roomy...I would recommend this to friends and family if they were looking for a new couch. The recliner we bought is manual not power and microfiber.It has been a year without issue but if you have animals it attracts hair.I hope that helps. Not power. Manual. It’s not leather or vinyl. Fabric but looks like leather. No it is not power . This is a cloth material. What does the color Pewter look like? It is very hard to tell on the computer. Hey J, they couch is to my eye more dark grey in color than brown. It has a hard suede feeling that lightens in color with use but doesn’t look worn out after the year I’ve had it. Dark gray. Like slate, except more brown rather than blue undertones. A nice neutral color, matches with most things. Very dark gray. Its definitely not black, but its a very dark charcoal color. Its very versatile. It's almost a brown/dark grey. Does it stain easily or is it leather like? BEST ANSWER: The Brinton collection is upholstered with a polyester and polyurethane blend fabric. It is easy to to clean and durable. It doesn't stain easily at all. It's fabric, but has a shininess to it that makes it look kind of like leather, but still feels like fabric. My old sofa was microfiber and showed everything, but this doesn't show any stains so far, I love it. It hasn’t stained for us at all, it’s not like leather it’s an interesting material. I’d recommend going to see it at a store I like it better in person. We have spilled on it numerous times and it just wipes away. It is not leather like though. It is soft. I love it. My favorite couch ever! It's leather like. I have not had problems with stains yet. So, most likely answer to your question is no. BEST ANSWER: Hello Donna, thank you for your interest in the Brinton 2-pc. sectional sofa! 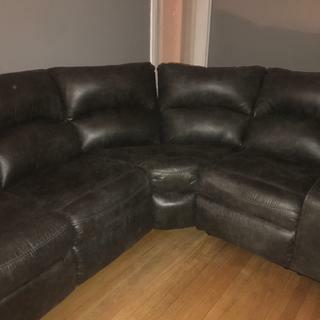 The right arm facing loveseat with cupholders is all one piece and cannot be separated. No, the cup holder section is connected to the chairs and cannot be removed. Does it includes everything picture? Left recliner, corner piece, console (cup holder) and right recliner. BEST ANSWER: Yes it does! Super comfy as well. We are very happy with our purchase. Yes...it’s pretty comfortable to, I’m happy with it. I need to replace the arm of the left side any ideas on where to get replacement material? BEST ANSWER: Hi Michelle. For assistance with replacements, please contact customer care at 866.383.4484, option 7. Will I be able to white down just with a wet towel ? BEST ANSWER: Hello Jones, please use the recommended cleaning instructions: Lightly brush or vacuum frequently to remove dust. Do not use water- or solvent-based cleaners. A professional cleaning service is recommended for an overall soiled condition. What is the warranty on this product and is delivery free? BEST ANSWER: Hello Melissa, please contact our online sales department at 866.383.4484, option 2 for assistance. We would be happy to provide all detailed warranty and delivery information! Do you have 60 days layaway? BEST ANSWER: Hello Jamie, please refer to our layaway policies: https://www2.raymourflanigan.com/customer-care/frequently-asked-questions.html For additional information and assistance, please contact our online sales department at 866.383.4484, option 2.
can the cupholder piece be removed? BEST ANSWER: The actual cupholders can be removed for cleaning. I'm confused by the dimensions here, it says the total is L: 117" x W: 104" x H: 38". But the lengths of sides are Right 100" & Left 87"... where does 117" come from? BEST ANSWER: The overall dimensions are 117 x 104 come from measuring from back edge (wedge piece) to the ends of the sofa. What is the length of each side of the L? BEST ANSWER: The dimensions for the left facing loveseat are L: 87" x W: 44" x H: 38". The dimensions for the right facing loveseat (includes reclining seats) are L: 100" x W: 44" x H: 38". Can it withstand dogs. Will it scratch or tear easily from their nails? BEST ANSWER: The upholstery on the Brinton 2-pc. 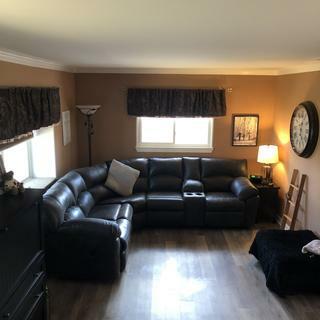 Sectional Sofa is 100% Polyester, which is known for durability that’s resistant to fading and staining, however no upholstery is completely pet proof, especially with a pet that scratches or chews. The nail marks would eventually show. Is there a charging station in the cup holder piece? Also, are the recliners electric? BEST ANSWER: The Brinton Sectional does not include a charging station and the recliner is manually operated. Where is this piece located? BEST ANSWER: The Brinton 2-pc. Sectional Sofa is located for display at our Raymour & Flaningan Outlet Centers.